The best store to buy basic tops from is Planet Blue. When I got back from London with my favorite new “winter” dress by Orion—which incidentally, now Planet Blue stocks, though not my dress—I needed a long-sleeved top to wear underneath it. I found the perfect v-neck top made from the softest cotton by Zooey. Once I did some further research on the brand, I realized they also have organic cotton, hemp and bamboo options. Currently their green line consists of environmental message tees. 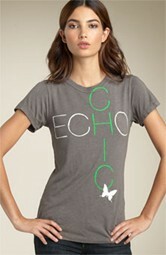 For every t-shirt you buy they donate $2 to Healthy Child Healthy World. I’m most excited about their upcoming green organic yoga line, as I’m about to start practicing again.